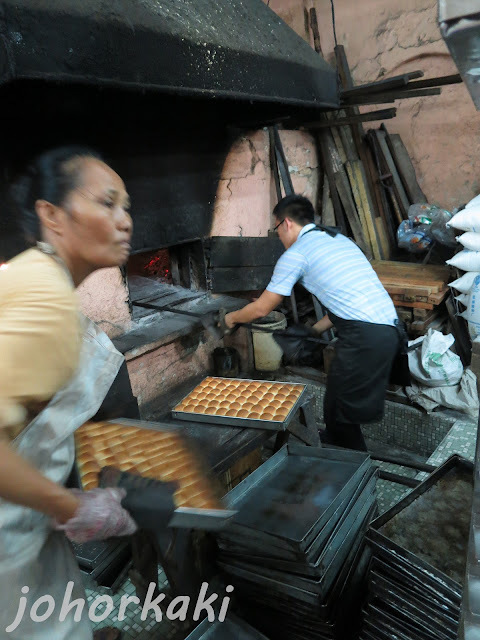 The popular Hiap Joo 协裕 bakery, which customers include the Sultan of Johor, has been operating in this hole in the wall shop in old downtown Johor Bahru since 1919. Hiap Joo bakery was started by an Englishman and was handed over to the great grandfather of the current owner in the 1930s before the former returned home to England. Not much have changed since then, and perhaps today as a piece of living history, Hiap Joo is now more popular than ever before. 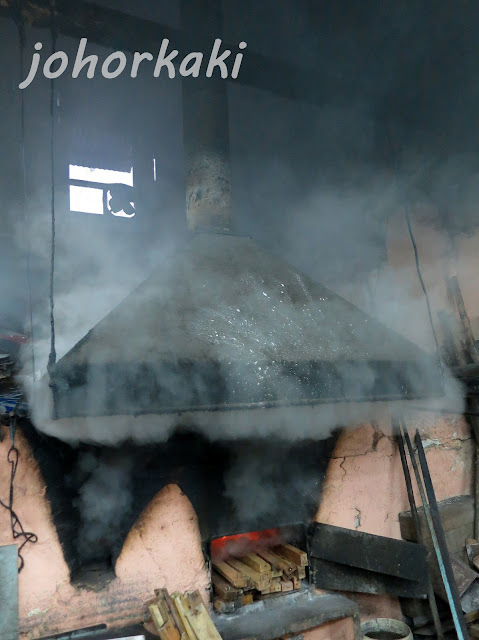 ﻿Even today, Hiap Joo’s breads and cakes are still baked using wood fire in the same soot coated, clay brick, kiln-like oven since it was founded. The wood used to fire the oven are mostly discards from construction sites brought here by building contractors. Hiap Joo, like many similar set ups in Johor, is a family business. I often see heart warming scenes of the whole three generation Lim family, young and the elders, all chipping in happily together. I also saw a lot of quiet pride and dedication. Every step in the process of making the cakes and breads, from start to finish, is made with the same personal touch and commitment. Today, the key task of baking with the vintage oven is handled by the founder's great grandson. The breads and cakes start coming out of the kiln at between noon to 2:00pm . Even the very last step, is done with the same focus and commitment. This banana cake is sliced by hand, and yet every single piece is precisely cut. They are all exactly the same size - if I had not seen it being done with my own eyes, I wouldn’t believe that it is hand cut! All these attention to details all finally adds up in the taste of the cake that attracts queues of regular customers waiting to get their first pick of Hiap Joo’s freshly baked confectioneries. Customers are often seen darting in to grab their cakes and then dashing back to their cars, parked illegally on the curb in the old town's narrow streets. 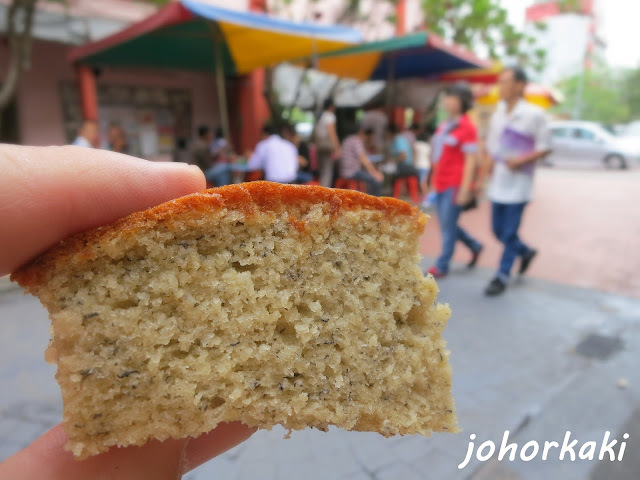 Hiap Joo’s star attraction is their delicious spongy banana cake. The famous banana cake is slightly charred on the outside with a mild smokey flavour and inside it is bouncy soft, fragrant and moist. As no chemical essence or artificial flavourings are used, the cakes are subtly sweet - not sugary. It feels light, spongy and airy, unlike the usual heavy, dense and grease saturated supermarket cakes bricks that leave me feeling bloated and stuffed. ﻿This large banana cake (cut into 10 pieces) costs RM8 (2012 price). Remember to try also Hiap Joo's coconut buns. 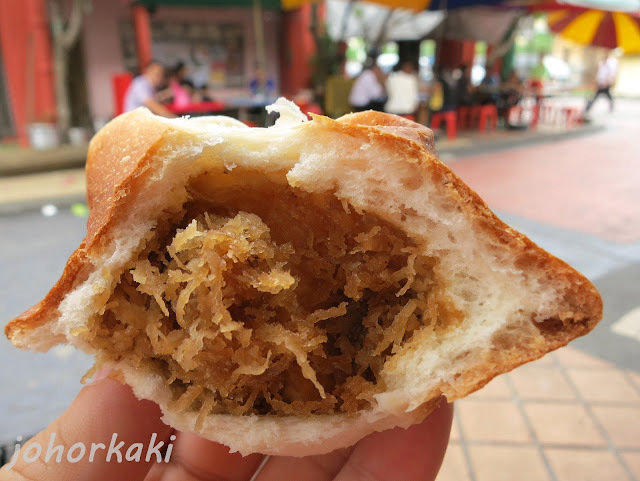 The fresh coconut shreds with gula Melaka wrapped by a fluffy smokey bun are juicy and not overly sweet. As Hiap Joo’s breads and cakes contain no preservatives, they are best consumed within a day and should not be kept for longer than 3 days. This is never a problem for me as Hiap Joo's cakes never lasted more than a couple of hours at home, sometimes they are all gone even before arriving home. 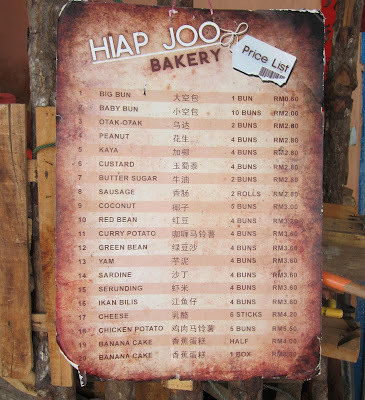 Whenever I am in the area I would pick up a banana cake or try the other items on offer at Hiap Joo. Hiap Joo’s cakes are always a joy to bring home to our families to enjoy together. Another traditional bakery well worth visiting for its curry puffs and breads as well as it's old time charm is Salahuddin's which is just a stone's throw away from Hiap Joo. ->> One of only two bakeries left in Johor that still uses a century old wood fired oven to bake their breads and cakes. Enjoy tradition, heritage and delicious food together. The signature banana cake is a Must Try. Banana cake is tasty, slightly too sweet. Bread is available from 12pm onwards and always sold out by 2-3pm. Banana cake available the whole day until sold out. Good to let your readers know that sale of bread starts at 10.30am while banana cake starts at 11.30am! Sorry it should b 11.30am onwards for bread and 12.30pm onwards for banana cake! Just visited today and was told such! Does Hiap Joo open on Monday? Does hiap joo open on sunday now?? Do note that Hiap Joo closes at 5.30pm, not 6pm.